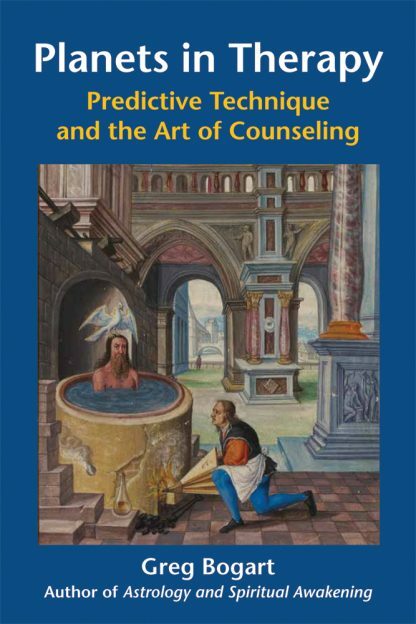 This book explores archetypal symbolism, predictive technique, and counseling process in therapeutic astrology. Combining insights from Jungian depth psychology, developmental theory, alchemy and dream symbolism with the precision of planetary transits, progressions and midpoints, Planets in Therapy is an inspiring approach to the healing art of astrology. Planets in Therapy clearly and succinctly explains the interpretation of the language and techniques of astrology, the depth psychological, transpersonal and spiritual meaning of planetary symbolism, and its power to heal and transform. Greg Bogart masterfully guides the reader through the principles of psychological astrology, emphasizing the process of selftransformation, spiritual evolution, and discovering the meaning in every event and every moment. A wide range of examples demonstrate how to apply this knowledge to skillfully help others as a counseling astrologer. Greg Bogart, Ph.D, MFT is a psychotherapist and counseling astrologer in the San Francisco Bay Area, and teaches in the Counseling Psychology and East-West Psychology programs at the California Institute of Integral Studies. He is also a lecturer in psychology at Sonoma State University. He is certified as an astrological counselor by the International Association for Astrological Research(ISAR) and National Council for Geocosmic Research(NCGR). Greg is the author of Astrology and Meditation, Astrology and Spiritual Awakening, and Dreamwork and Self-Healing.